I fully intended to write a post yesterday for the Real Life Homeschool blog hop. But, well, life got in the way. So I figured now was a perfect time for a post about my least favorite question. The honest answer is -- I don't. Some days are like the first two this week. Or today, for that matter. I am not feeling well, and end up taking a nap or two because I desperately need it. I have five different kids who need to be doing school, and all of them need at least some attention from me. I have deadlines for work, and those projects always seem to take far more time than I think they will. I haven't done laundry in forever and that is in desperate need of getting done. I want to start stitching on the cross-stitch project my mom was working on before she died. My family seems to think they should eat. Did I mention I need a nap? I don't have time to do it all, and especially not to do it all well. 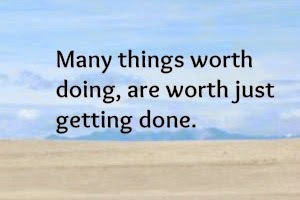 You know that saying out there, "Anything worth doing is worth doing well"? Yeah. Right. I have a different one. And honestly, I don't even finish all the stuff that is worth doing. But when it comes to certain things, I do not worry about doing it "well." I have to cheat something. So that means that you can't eat off my floors. The inside of the fridge is usually not never pristine. I use audiobooks instead of reading aloud to my kids. I make them figure out their own school stuff way too often. The difference between a toilet scrubbed "well" and one that is "just done" is a whole lot of time, mostly. I've got hard water stains, and yes, I've seen the miracle vinegar trick on Facebook to get rid of them. But that takes time. Time I could be spending reading with my kids, or working on math, or heading outside to run around. I don't fold socks and underwear either. They get stuffed into drawers, and that is good enough for me. As for the homeschool stuff, I feel like I never quite do enough there. Which is probably my topic for tomorrow. Bottom line for today, though. I don't do it all. I probably don't even do all the important stuff. And the stuff I do get done is often at the last minute. Your house sounds marginally cleaner than mine. LOL I can't do it all either. Glad I'm not alone!